Most people at some time or another have wished that they could hear the thoughts of a friend, an enemy, or better yet, a frienemy. But what if they could hear your thoughts too? What if, in fact, everyone could hear everything that passes through the minds of anyone nearby and also see all the images floating through those brains? And, while we’re at it, what if we added the thoughts of all animals, no matter how stupid they were? This is the life of the settlers on New World, who came to found a utopian society based on their faith. What they found is the disease, the Noise, which killed off all the women and leaves the men constantly battling the Noise. This is the life Todd Hewitt was born into, just before the Noise killed off the women. Todd is awaiting his thirteenth birthday in years of thirteenth months each. Because on his thirteenth birthday, he will be a man, no longer the last boy left in Prentisstown. What Todd doesn’t know, despite the noise, is that there is a terrible secret associated with the rite of passage into manhood. And, in that last month of boyhood, while going out to pick apples in the woods, he has found something he’s never found in his life—a pocket of quiet. When the town mayor, Mr. Prentiss hears in Todd’s noise that there is quiet in the swamp, Todd’s world collapses. His guardians, Ben and Cillian, pack him off with a journal Todd’s mom had written before she died, some food and medicine. Ben and Cillian are preparing for a gunfight against the townsmen, and are about to risk their lives to make sure Todd gets a head start in escaping. Todd doesn’t understand what has gone so terribly wrong until he makes it to the swamp and discovers that the pocket of quiet is inhabited by a girl. How could there be a living female, and why doesn’t she have the Noise disease? The answers are horrific. Todd, along with his rather dumb dog Manchee, whom Todd can communicate with because of the Noise, and who turns out to be a more important companion that Todd could have imaged, take the girl and they run. An army is chasing them, as is a madman preacher who sees the girl as a sign from God and wants to make sure the proper sacrifice is made. Every turn of events is a dilemma about right and wrong, about whether to kill or run, about who to protect and who to sacrifice. This is a perpetual high-alert book, with fear and action around every bend in the road. After loving A Monster Calls, I decided to explore more of Patrick Ness’s work. 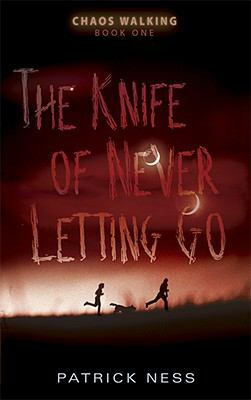 The Knife of Never Letting Go is the first novel in the Chaos Walking series. It ends on an absolute cliff hanger, and you will have to read the second book. Don’t be afraid of the length of these novels. They are so action-packed and emotionally intense, you’ll fly through the story. Whiteknuckler. This entry was posted in Adventure Stories, Fiction, Over 375 pages, Sci-Fi/Futuristic, Young Adult Literature and tagged Chaos Walking series, future dystopia. Bookmark the permalink.